Biological diversity means the variability among living organisms from all sources including terrestrial, marine and other aquatic systems and the ecological complexes of which they are part; this includes diversity within species, between species and of ecosystems. Biodiversity is important because It boosts the ecosystem’s productivity where each species, no matter how small, has an important role to play. The word “biodiversity” is not an action word. It is a descriptive word. Biodiversity is a desirable state of being in Nature. The word does not tell us how that state of being is achieved even though we are told that we must achieve some form of biodiversity. This is a paradox both in the field of environmental education and in scientific research. This is not to say that the idea of biodiversity is not useful. After all, in many cases we can physically observe biodiversity in an ecosystem and we can sometimes count the number of plants and animals in an ecosystem. But the questions of “how” and “why” elude us without more tools. The point is that when we address issues of biodiversity, we really should be focusing on the underlying basis for biodiversity which is the structure of energy flow networks that unites all of the flora and fauna in a given ecosystem. In other words, we need to be talking about energy flow networks that describe the energy flow relationships between all organisms in an ecosystem. We need to employ the scientific principles of “systems thinking” to describe biodiversity. The transportation and transformation of energy is a fundamental and essential process of life that is carried out by every plant and animal on Earth. Life cannot exist without this process. The process can only take place when there are energy flow conduits between life forms. This network of energy flow interconnections is called an ecosystem. Fortunately, the application of systems science to the quantification of ecosystems sits in the wings waiting for our attention. With systems science, we have an avenue for quantifying biodiversity and identifying the diversity of a given ecosystem in more specific terms. Systems literacy and systems consciousness is a skill that people who do conservation work must acquire because it is the flow of life’s energy that must be protected. A consciousness for the energy flow networks of Nature’s living systems should be a priority goal of every environmental education program. Systems science has a history of quantifying networks. Systems literacy is something that environmental educators need to be teaching and demonstrating to their students. In this essay, I offer some detail about the usefulness of applying systems thinking to the definition of biodiversity. 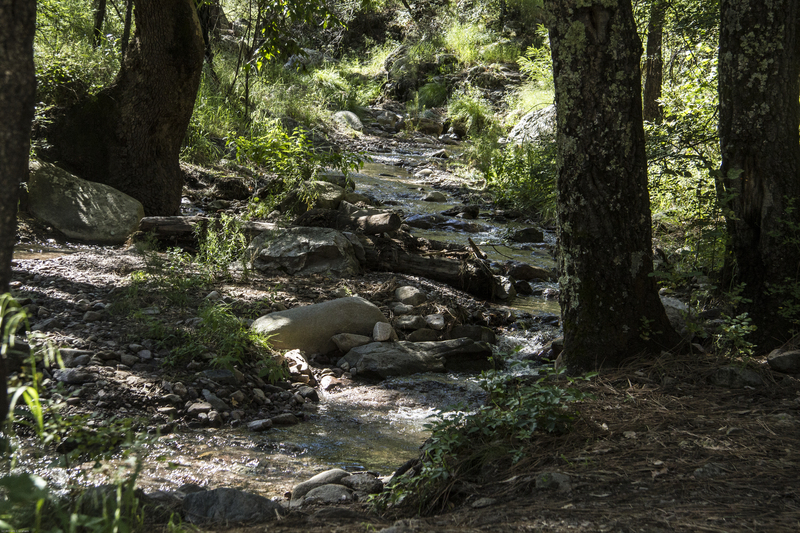 All organisms connect and interact with other organisms and the environment within an ecosystem that Kevin McCann calls “biostructure”, This biostructure is what contains life’s energy flow networks and defines the biodiversity of an ecosystem. It follows that, to understand the biodiversity of an ecosystem, one must first understand its biostructure. Generally, one portrays biostructure by portraying energy flow through the construction of food web diagrams.which give a picture of how the ecosystem operates. With this energy flow diagram, one can hypothesize the effect of adding or removing a component in the ecosystem under study. These diagrams are also wonderful teaching tools for environmental educators. As an example, I provide a food web diagram for an estuary that borders the Sea of Cortez in Mexico. Food webs, such as the one displayed here, are methods for visualizing biodiversity. The food web is an important conceptual tool for illustrating the feeding relationships among species within a community. They reveal species interactions and community structure. They provide an understanding of the dynamics of energy transfer in an ecosystem. They show how plants and animals are connected in many ways to help them all survive. They provide a framework to link community structure with the flow of energy and material. In doing so, food web diagrams help reconcile biodiversity with ecosystem function. Food web studies explore how energy flow (feeding) relationships influence the stability of communities. Food web studies help predict how species losses propagate through communities as well as influence community stability and the functioning of an ecosystem. By visualizing biodiversity and merging biodiversity research with food-web theory, new and important avenues for ecological research emerge with implications for biodiversity conservation. In particular, these studies help define the negative impact of eliminating highly connected species within an ecological community. You don’t have to be a scientist to define what would happen to the estuary depicted by this food web diagram if certain organisms were removed from the lagoon. The most obvious is the mangrove trees. These trees, that bring energy to the lagoon from the sun are so vital to the flow of the lagoon’s energy that their removal would have a highly significant negative impact on the flow of energy. 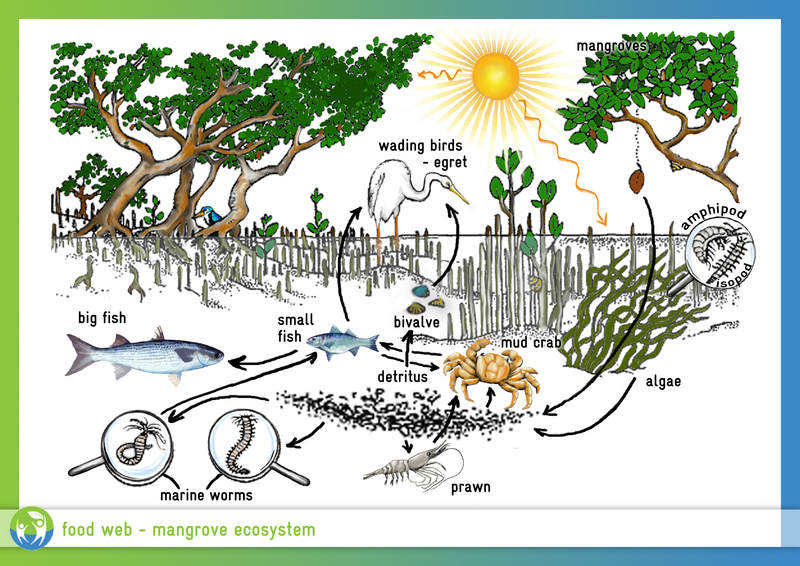 Take another look at the food web diagram and mentally remove the mangroves from the picture. Which species would be affected? Yet, it was once suggested that this lagoon be developed into a marina. Another tool for portraying biodiversity of complex ecosystems is a network diagram which is a schematic diagram portraying how things are connected as well as the dynamic relationships. Nature’s complex systems contain special networks that facilitate the flow of energy. These networks have a physical architecture and associated organizing principles that control and connect the components within the system. Understanding these systems can come from looking at both the routes for energy flow (called network architecture) and the dynamic relationships within these networks. The objective of the diagram is to understand the organization of energy flow relationships between species which are a system’s connecting points (called nodes) in a complex system. 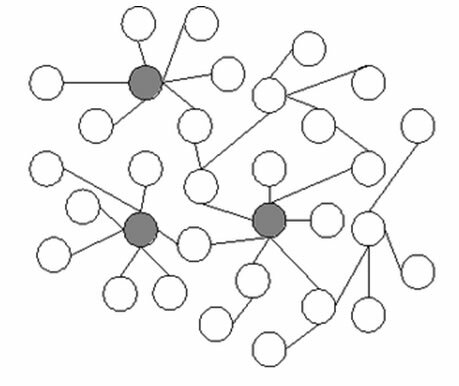 A network diagram, shown below, is a schematic diagram of how nodes are connected. Nodes are usually represented by heavy dots, circles, or iconic representations of natural objects. The most successful of Nature’s network patterns have a high connectivity within their systems. They are said to be “complex networks” because they have a structure that doesn’t exist in simple network models. Instead, their structure is somewhere in between totally regular and totally random. It is important for the naturalist to understand the energy flow networks within an ecosystem under study and how certain phenomena or human interference might adversely affect those energy transportation and transformation pathways. • Complex networks are self-organizing. Energy networks are dynamically formed by the continuous addition of new nodes. • New nodes are very specific about which existing nodes they will attach to. They are said to employ “preferential attachment”. 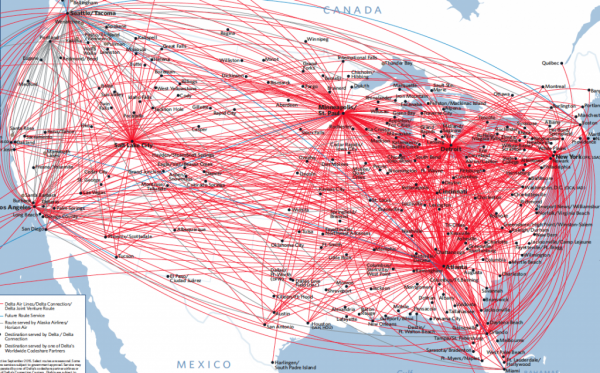 To illustrate the characteristics of a complex network model, we examine an airline route map which is probably familiar to many airline travelers. Here, there are very few highly clustered hub cities, where flights connect with many small towns. Atlanta and Salt Lake City are hubs on this map. But, there are many small town airports whose airline routes are connected to only one or very few hubs. The airline hubs contribute heavily to the overall connectivity and resilience of the network. Small town airports contribute very little to the network’s connectivity. If a snowstorm hits the region of a small airport, there would be little or no effect on travel within the route network. But, if the Atlanta or Salt Lake City hubs have severe weather, the entire airline travel network will be adversely affected. 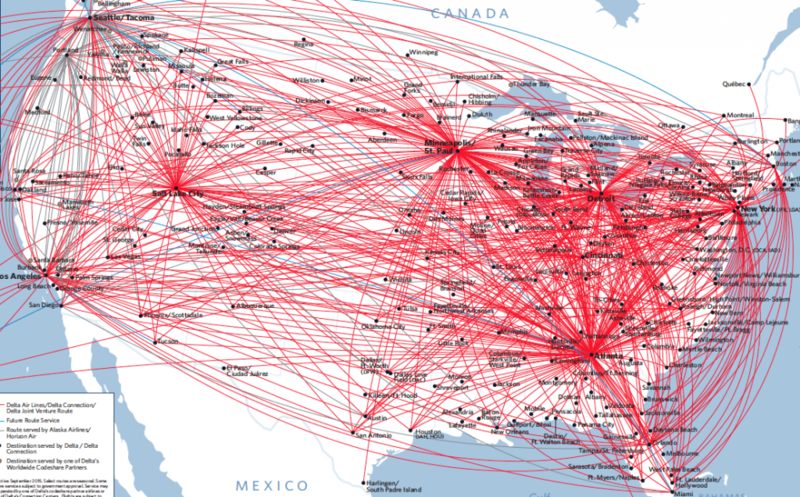 The architecture of the airline route network map is an example of a complex network much like the complex energy distribution networks we find in Nature. The contribution of the highly clustered hubs to the overall connectivity of the network is very high. The connectivity contribution of the nodes with fewer links is much lower. The airline route map is a complex network that is similar to a system in Nature that is biodiverse. A “hub” in an airline route system is the same as a keystone species that has energy flow connections to numerous other species. If one species that is remotely connected to the energy flow of a keystone species goes extinct or is severely disturbed by humans, the keystone species is probably not affected. But, if the keystone species is killed off, many species will also die because they depend upon energy flow from the keystone species. This, by definition, is a measure of resilience. 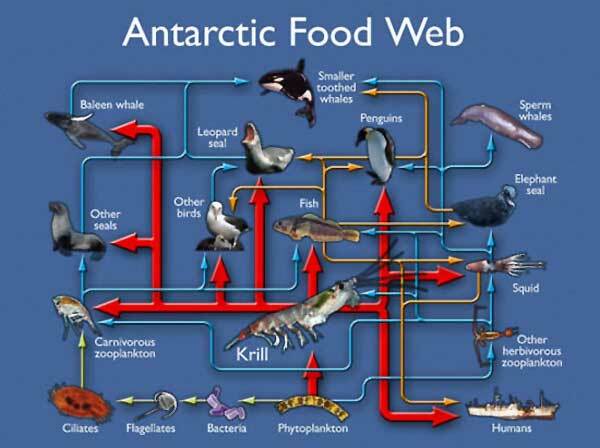 The Antarctic food web shown above is a good portrayal of the idea of biodiversity and resilience. Krill is a keystone species in the Antarctic and the Southern Atlantic Ocean because it is a primary food (energy) source for many creatures. The krill population is considered a “hub” in the diagram of the ecosystem shown here. If the krill were to die off, there would be a major crash in the ecosystem because the food for many species would no longer be available. But if only the penguins were to die off, the ecosystem would probably survive. This discussion suggests that what is needed to understand biodiversity and resilience is a systems network consciousness. Systems thinking must be taught in schools wherever and whenever biodiversity is taught. This includes the practice of identifying energy flow conduits and the construction and analysis of visualizations much like those that have just been discussed. There is a wonderful video entitled “Biodiversity, ecosystems, and ecological networks“ produced by the California Academy of Sciences. The video describes much of what has been discussed in this essay. In a special note to environmental educators, I strongly suggest that this video be part of any instruction about biodiversity because it emphasizes the need for the development of a network consciousness when one studies biodiversity. Our earth is a living system that transports and transforms energy. The key to an active ecoliteracy that results in a healthy environment for all life on earth is the building of a systems view of life into the minds and hearts of humanity, This worldview includes the fact that all of Nature is interconnected and interdependent. Environmental education is not simply offering facts. Environmental education must be hands-on and place-based if ideas, facts, and effective conservation strategies are to become a consciousness in the minds and hearts of our youth. Environmental education must include the the passing of this consciousness to future generations. Nothing in Nature exists in isolation. The movement of life’s energy on Earth, which originates in the sun, takes place because everything is interconnected and interdependent. Your consciousness of interdependence in Nature means that, every time you engage Nature, you ask yourself how a creature, a plant, yourself, or a natural object is connected to another and to Nature’s greater scheme of things. With this awareness you are prepared to protect Nature’s environment that sustains you. And, you create your legacy by encouraging others to do likewise. You are strongly encouraged to become one of my 11,000+ followers on Twitter. My Twitter ID is @ballenamar . With Twitter, in addition to receivingregular Tweets that announce my essays, you will see when I retweet something that I read and that I think is important.